Once again we are giving you options. Before you begin uploading, you’ll need to choose how you’ll sell your work in the MOJO Themes marketplace. With that being said, you’ve got a couple options. We wanted you to have a choice on how you sell EACH ITEM. As you upload unique items to sell you choose to sell that ITEM exclusively or non-exclusively. There’s no need to just strictly sell as a straight up exclusive seller across the board, especially if you have commitment issues. You pick how you want to roll with us on each item. Selecting this exclusivity it works as follows. You can upload your item to both MOJO-themes.com and MOJOMarketplace.com, but you agree to not sell that same item on any other site. When you begin, your percentage of the sale is set at 50%. As you increase in the number of sales you will also increase in the percentage of the profits. The exclusive seller pay structure rewards those that put the extra time and TLC into their items. Please take note that those caught distributing your work while signed up as an exclusive Seller will have consequences (far beyond the deck). New commission rates as of August 29th, 2011. 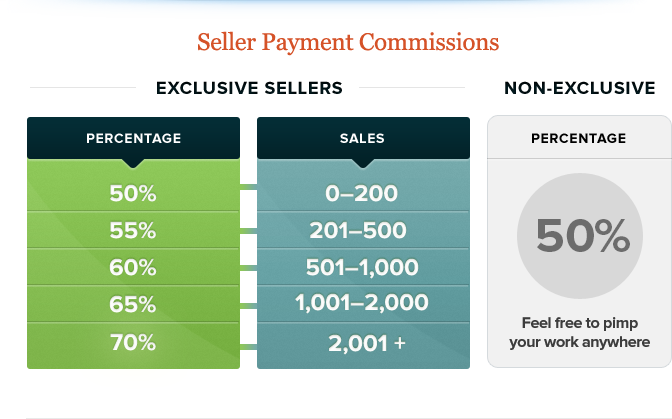 If you sign up as a non-exclusive seller, we have a static compensation at 25% 50% (as of April 2, 2014). With this you are free to pimp your work out as much as you so choose. We don’t judge though so don’t worry. Once your account has reached at least $50.00 you can request a withdrawal from our site. We payout NET15 so at the end of each month, your commissions will be paid the following month on the 15th. We offer PAYPAL for our payout method. You can request a withdrawal here.